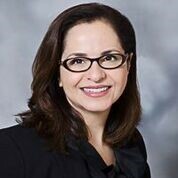 Nasrin Rezai is GE’s Global Chief Information and Product Cyber Security Officer, responsible for cybersecurity across the organization. In this role, she is responsible for all aspects of cyber security strategy and operations for GE products and enterprise, including incident response, threat intelligence, security services, architecture, commercial OT security, and regulatory & compliance. Her previous roles include Global CISO for GE Capital and head of Corporate Governance, Technology Risk and M&A security, for the industrial GE businesses. Prior to GE, she served as SVP, Chief Tech. Risk Officer in the Enterprise Risk Management Organization at State Street and as CTO of Security at Cisco Systems. Throughout her career, Nasrin has promoted engineering and architecture in designing security solutions for large enterprises. She is passionate about helping others develop their potential, and mentors many young men and women. She holds a master’s degree in business administration and a bachelor’s degree in information systems. She also holds an Executive Certification from Harvard and Cambridge. Nasrin lives with her family in the Richmond, Virginia area.